Deutsche Bank - "The European flow picture remains very negative"
Cleaner positioning. 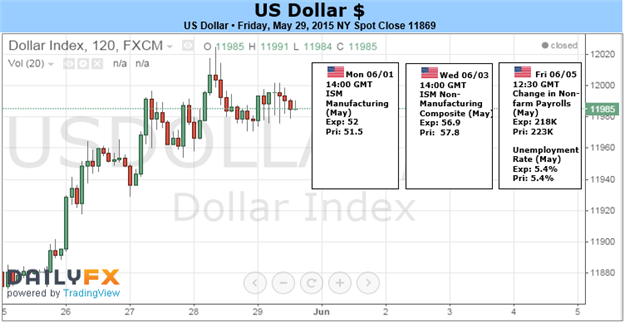 "Equally, positioning metrics suggest that dollar longs have being pared back. A regression of currency manager index returns against the DXY now points to flat positioning, while the IMM shows a greater than 50% paring back in dollar longs," Deutsche Bank notes. All about the Fed. "History has been all about the ECB, but the dominant driver of FX is now likely to be the Fed. On that front, monetary policy could come back in focus sooner than many expect," Deutsche Bank argues. 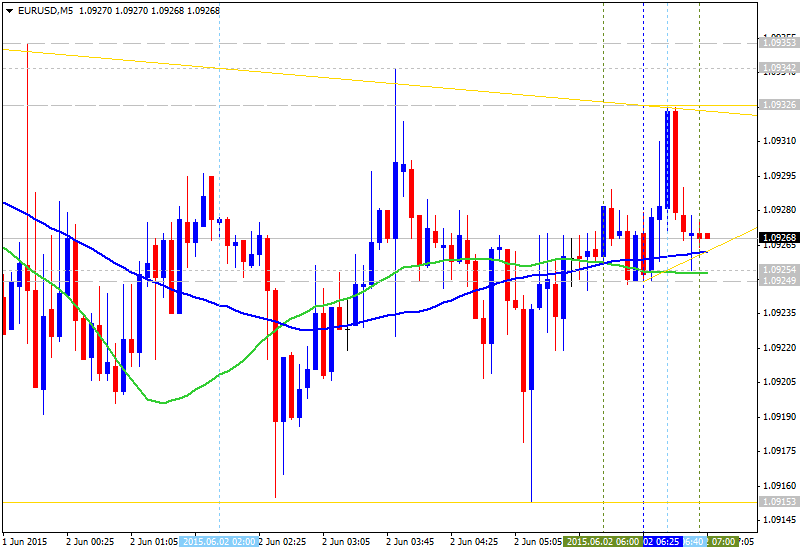 Euro still a good short. "While market focus is very likely to shift to the other side of the Atlantic, EUR/USD is still a good vehicle to express dollar longs. To start with, the euro is a consistent underperformer around Fed turning points," DB advises. Negative euro flows. "Beyond that, the European flow picture remains very negative. The recent VaR shock in bund yields is likely to further discourage, rather than encourage fixed income inflows," Deutsche Bank adds. Target: "We continue to target a move down to 1.00 by the end of the year," Deutsche Bank says. Conclusion. "The ingredients remain in place for a strong dollar trend this year. Given that focus is likely to shift to Fed tightening, rather than ECB easing, we like rotating positions away from the trade-weighted euro towards longs in the trade-weighted dollar. Still, EUR/USD should continue to be a primary casualty of broad dollar strength," Deutsche Bank concludes. U.S. second GDP estimate was released, indicating the economy contracted 0.7% in the first quarter, amid harsh winter storms, strong dollar weighing on exports and labor disputes at West Coast ports. While the first estimate a month ago, showed 0.2% growth. Economists say the first quarter GDP reading is not accurate and expect a pick-up in the next quarter. Also upbeat data in Durable goods orders and Consumer sentiment fuels optimism about US economic growth. US ISM Manufacturing PMI: Monday, 14:00. U.S. manufacturing growth remained unchanged in April, posting 51.5. The reading was lower than the 52.1 anticipated by analysts. New orders increased to 53.5 from 51.8 in March but employment fell to contraction. However, April’s figure still reflects growth. The manufacturing sector os expected to expand further to 52.8. 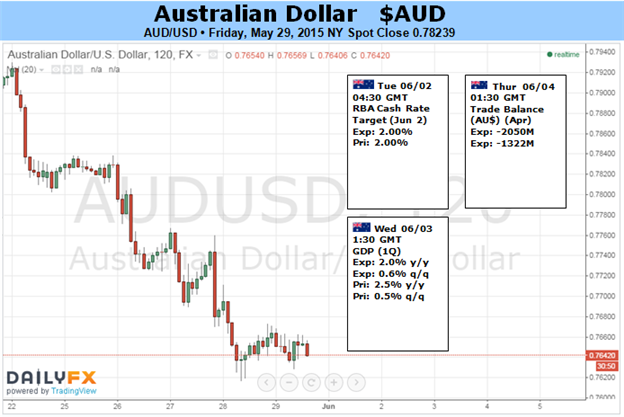 Australian rate decision: Tuesday, 4:30. The Reserve Bank of Australia cut interest rates by 25 basis points to a record low of 2% in its May meeting. Analysts anticipated the move. RBA governor Glenn Stevens noted in his previous statement that additional cuts might take place in order to sustain growth. However, economists do not expect further cuts in the coming months. Analysts expect rates to remain unchanged in June. Australian GDP: Wednesday, 1:30. Australia’s economy continued to expand at a mild pace in the fourth quarter of 2014 growing 0.5% compared to 0.4% in the third quarter. Economists expected a higher figure of 0.7%. Data was more encouraging in the non-mining sectors and consumer spending also improved. However, domestic demand still did not react to lower interest rates, lower petrol prices and the weaker currency, therefore may require additional rate cuts to spur growth. The economy is expected to grow by 0.6% this time. Eurozone rate decision: Wednesday, 11:45. The European Central Bank kept interest rates unchanged in April, at a record low 0.05% and maintained overnight deposits at minus 0.20%, to prevent banks from stacking excess reserves with the central bank. Mr. Draghi stated that the Eurozone has finally turned a corner after years of recession with renewed growth. While a weak euro spurs exports due to cheaper products, low oil prices are raising the purchasing power of the region’s consumers and businesses. The ECB is expected to inject over 1 trillion euros through September 2016 into the eurozone economy via bond purchases in hope of raising inflation back to the ECB’s medium-term target of just below 2%. The ECB is not expected to change rates this time. US ADP Non-Farm Employment Change: Wednesday, 12:15. US Private sector employment increased by 169,000 jobs in April according to the April ADP National Employment Report. The reading missed predictions for a 199,000 gain and was preceded by a 175,000 increase in March. April job gains fell below 200,000 for the second straight month. However, the collapse of oil prices and the rising dollar weighed on job creation. US Private sector is forecasted to grow by 200,000 in May. US Trade Balance: Wednesday, 12:30. US trade deficit rose in March to $51.4 billion due to a surge of 7.7% in imports. Trade deficit reached a 6-1/2 years high, indicating the economy contracted in the first quarter. However, growth accelerated in April, suggesting the first quarter contraction was only temporary. Economists forecast trade deficit to rise mildly to $41.2 billion. In a separate report, the Institute for Supply Management showed the services sector rose to 57.8 in April, the highest since November. Meanwhile, exports increased only by 0.9% in March. US trade deficit is expected to improve to 44.2bl in April. US ISM Non-Manufacturing PMI: Wednesday, 14:00. Service sector activity edged up in April to 57.8 up from 56.5 in March. The big increase was higher than the 56.2 forecasted by analysts. The reading raised optimism that the U.S. economy has rebounded from the soft patch in the first quarter. The New Orders Index rose 1.4 points from March to 59.2. The Employment Index inched 0.1 points to 56.7 from the March reading of 56.6. The Prices Index declined 2.3 points from 52.4 reaching 50.1, indicating prices increased in April for the second consecutive month, but mildly. US Service sector activity is expected to reach 57.2 this time. 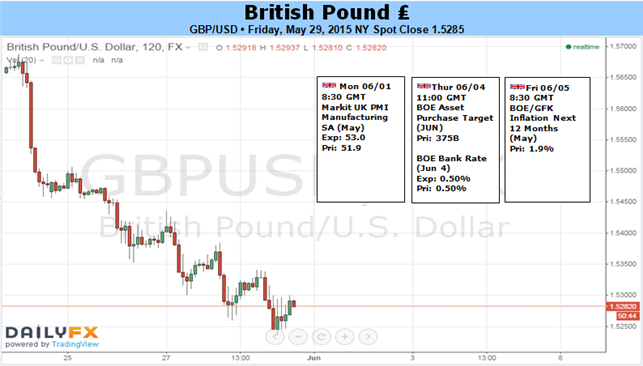 UK rate decision: Thursday, 11:00. The Bank of England policy makers chose to continue maintaining rates at a record low of 0.50%, This policy was introduced more than six years ago. Savers received lower returns, but mortgage borrowers benefited having lower payments. The Bank’s QE remained at £375bn. The BOE is expected to raise inflation towards 2%, however, the rate stood at 0% in both February and March. Officials stated that inflation could also turn negative at some point in the coming months because of the fall in oil prices. The Bank expects rates to remain on hold until at least the first quarter of next year. Economists expect the Bank of England will keep its monetary policy unchanged. US Unemployment Claims: Thursday, 12:30. The number of Americans filing new claims for unemployment benefits increased last week to 282,000, rising more than anticipated but remains positive. Analysts expected claims to decline to 271,000. Despite the volatility of this weekly reading, the number of jobless claims has been generally declining since 2009, indicating a positive trend in the US labor market. The four-week moving average rose by 5,000 to 271,500 last week. The number of jobless claims is expected to reach 277,000 this week. Canadian employment data: Friday, 12:30. The Canadian job market shed 19,700 positions in April. This disappointing release can be explained by the unexpected rise of 28,700 jobs in March. However, broader economic data still suggests the Canadian economy is recovering and should rebound in the coming months. The unemployment rate remained unchanged for the third straight month at 6.8%. The Canadian economy added 46,900 full-time positions and shed 66,500 part-time jobs. The Canadian economy is expected to gain 10,200 new jobs, while the unemployment rate is expected to remain at 6.8%. US Non-Farm Employment Change and Unemployment rate: Friday, 12:30. US job-creation rebounded in April with a 223,000 job addition, following March’s disappointing revised release of 85,000 positions. The unemployment rate fell to 5.4%, the lowest since May 2008, compared to 5.5% in Match. Wage growth accelerated at a slower than expected pace inching 0.1% in average hourly earnings compared to 0.2% rise in March. All in all, the NFP report suggests the economy is nearing full employment as defined by the Fed indicating growth in the coming months. US labor market is expected to grow by 224,000 and the unemployment rate is expected to remain at 5.4%. Though the USDollar cooled its pace modestly from the strongest weekly advance in two years, the currency nevertheless put in for another impressive advance. GBP/USD remainsat risk of facing a further decline in the week ahead should the fundamental developments coming out of the U.K. & U.S. heighten bets of seeing the Federal Reserve normalize monetary policy ahead of the Bank of England (BoE). Japanese Yen Stumbles, but is a USDJPY Rally Above ¥124 Justified? The Japanese Yen finally broke out of its long-standing range versus the US Dollar and fell to decade-plus lows. Momentum clearly favors further US Dollar gains and Yen losses, but key US event risk and a planned speech from the Bank of Japan offer the potential for volatility in the week ahead. The Australian Dollar is bracing for a volatile week ahead, with the RBA in focus domestically while Chinese and US news-flow threatens to deliver external shocks. Gold prices are lower for a second consecutive week with the precious metal off by more than 1.2% to trade at 1191 ahead of the New York close on Friday. "The EUR/USD may swing toward the downside later this week, having failed to break through strong resistance around the 1.10 mark, says IG Securities market analyst Junichi Ishikawa in a morning note. Concerns about the Greek situation and possible upbeat U.S. data out later this week will likely keep a lid on any strong gains in the pair, he says. 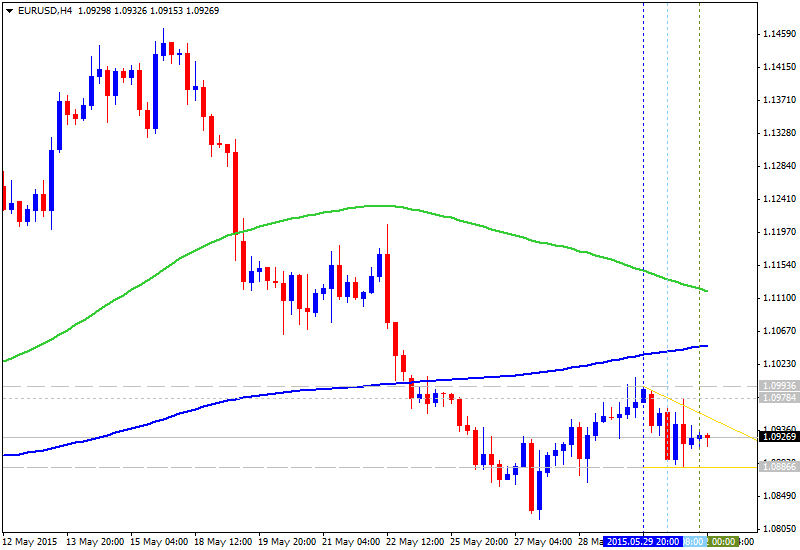 The focus is on whether the pair, now at 1.0950, can stay above the 1.08 level, its low of May 27. 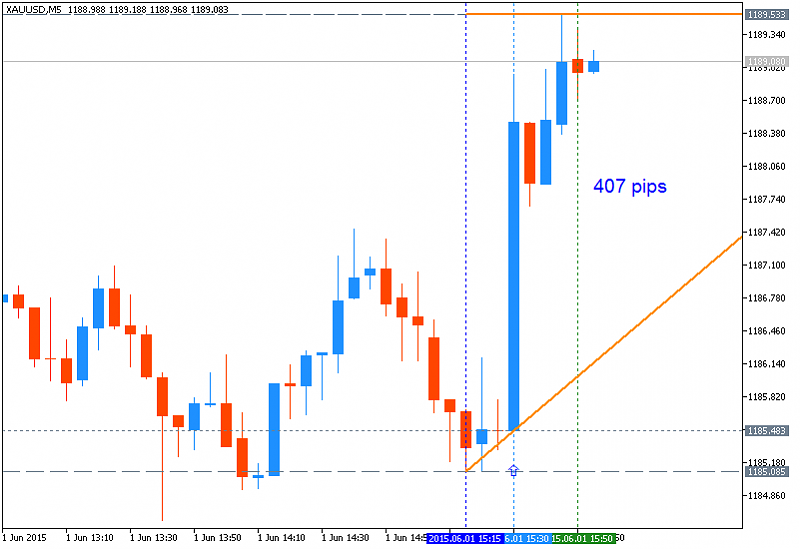 Still, should a surge of short positions kick in, the pair may be able to finally break through the upside resistance, but that kind of upside momentum will likely be capped around 1.1145, the 21-day moving average, he adds." 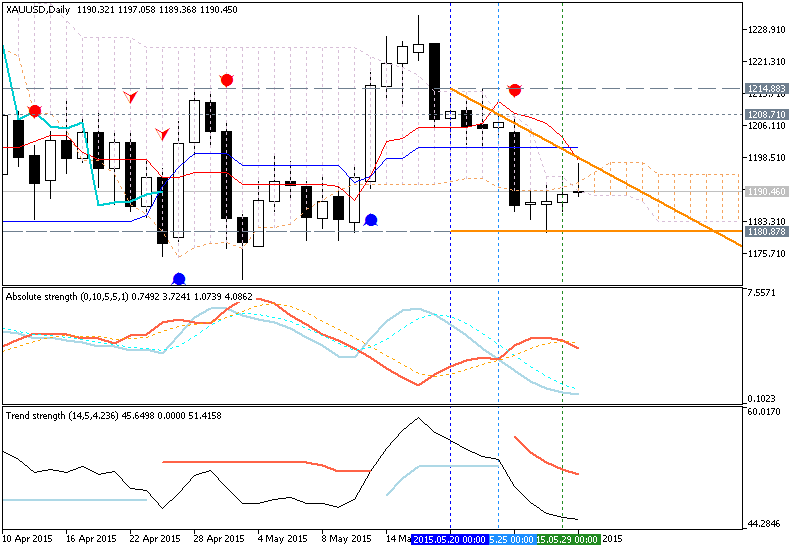 Gold prices are trading in a narrow range in Asian trade. 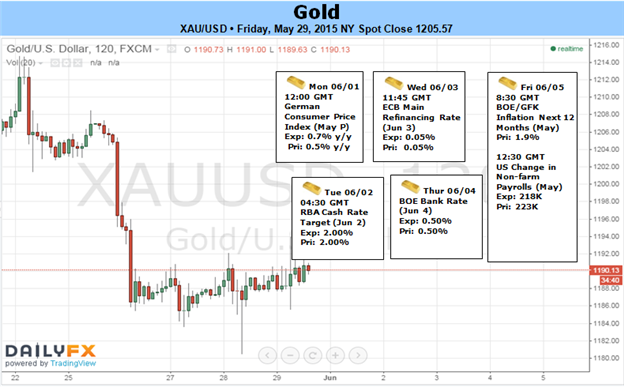 The precious metal has largely been taking cues from the expected timing of Federal Reserve’s interest rate increase. Data issued late last week showed the U.S. GDP fell 0.7% in the first quarter, which traders are interpreting to mean that a rate increase may come only late this year. However, the dollar has held steady resulting in little price impact on gold as the two typically have an inverse relation with each other. “The only trigger for gold could be Greece, if it signals a debt default,” says Gnanasekar Thiagarajan, director of Commtrendz Research. 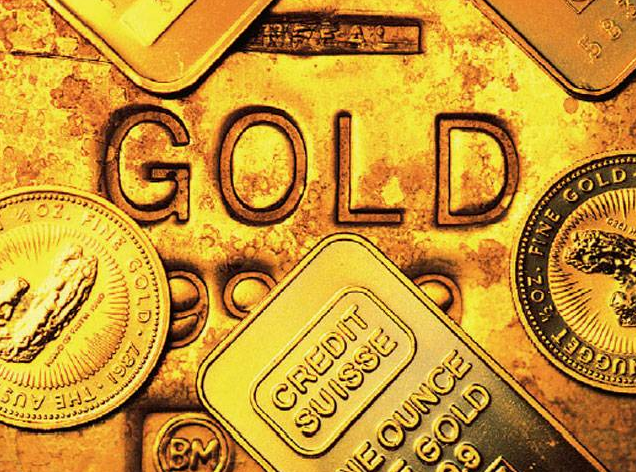 Investors typically buy the precious metal during times of geo-political uncertainty. Spot gold is currently trading up 65 cents at $1,190/oz. According to the weekly Kitco gold survey, both Wall Street and Main Street are expecting to see higher prices in the near-term; however, the analysts surveyed have a stronger upside bias. Sean Lusk, director commercial hedging division at Walsh Trading said that gold has the potential to pop higher next week but prices will remain within the $100 range between resistance at $1,230 an ounce and $1,130 an ounce. “Right now there is a lack of conviction to take gold either way; I don’t think that is going to change,” he said. Bart Melek, head of commodity strategy at TD Securities, said that although there is a lot of important economic reports to be released next week, unless the data is widely outside of expectations, it won’t change the perception that the Fed will still hike rates in the second half the of year. “I just don’t think we will see a break out next week,” he said. “So long as the data is not horrible the expectations will remain that the Fed will raise interest rates in September,” he added. George Gero, senior vice president at RBC Wealth Management, said that he is slightly bullish on gold next week as the market has already priced in higher interest rates, limiting gold’s downside; however an increase in wage, in Friday’s employment report could be seen as positive for gold because it is considered inflationary. Ronald-Peter Stoeferle, fund manager at Incrementum AG and author of the In Gold We Trust report, agreed that the wage data in the employment report will be an important indicator for the gold market in the near-term. Last edited by TheNews; 06-01-2015 at 06:56 AM. [USD - Core PCE Price Index] = Change in the price of goods and services purchased by consumers, excluding food and energy. "Personal income increased $59.4 billion, or 0.4 percent, and disposable personal income (DPI) increased $48.8 billion, or 0.4 percent, in April, according to the Bureau of Economic Analysis. Personal consumption expenditures (PCE) decreased $2.6 billion, or less than 0.1 percent. In March, personal income increased $4.0 billion, or less than 0.1 percent, DPI increased $0.5 billion, or less than 0.1 percent, and PCE increased $65.6 billion, or 0.5 percent, based on revised estimates. Real DPI increased 0.3 percent in April, in contrast to a decrease of 0.2 percent in March. Real PCE decreased less than 0.1 percent, in contrast to an increase of 0.4 percent." The euro skidded 0.8 percent to around $1.0892 on Monday after Greece missed a self-imposed Sunday deadline to reach a deal with its lenders to unlock crucial aid. An agreement is seen as key for Greece avoiding a debt default and dodging a potential exit from the euro zone.